PTOEC of Belleville knows of the amazing benefits that Special Olympics Illinois offers for its athletes. They know that Special Olympics Illinois dramatically changes the lives of the athletes. PTOEC (Parent Teacher Organization for Exceptional Children) has been participating in the Polar Plunge for four years. They became involved in the Plunge because two of their agency’s members are Global Messengers. The Global Messengers are invited to the Plunge to mingle and thank the plungers for their participation. One of them thought the Plunge looked fun and keeps coming back every year. Initially, the team did not dress up in costumes when they started plunging. When PTOEC team members saw other teams dressing up, they became inspired to wear costumes. So far, the team has dressed up as dalmatians, polar bears, and a mix of random penguins and Hawaiians. You can count on PTOEC to always bring a dozen people on their team to plunge. They put a call out for plungers on their website and ask athletes on various sports if they want to plunge. The team this year might be their biggest team to date because a school group will join PTOEC this year. Last year, PTOEC raised $3,500 and they keep getting better each year. The team raises their money through the team members’ personal websites, work and family and friends. An exciting point about the Area 12 Plunge is that whatever agency raises the most money at the Plunge can nominate an athlete to light the cauldron. One of their team member had the opportunity to light the cauldron at Spring Games. Colleen Nesbit was chosen because her brother raised the most money for the team. The team has two words for new plungers or those thinking about plunging: “Be Quick!” Be quick to gather plungers, be quick to run in and be quick to get out. PTOEC returns every year because of the strong commitment to their athletes and the program that support them. They know first-hand what Special Olympics has done for their athletes and they want to give back to the organization that makes amazing changes. 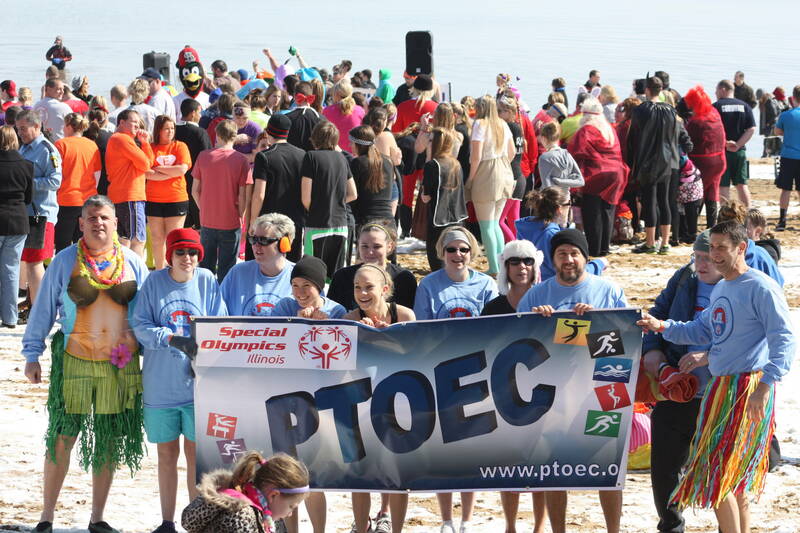 The PTOEC team will be plunging again this year at noon Saturday, Feb. 27, at the Main Beach in Carlyle Lake in Carlyle. If you are interested in joining the PTOEC team for the Carlyle Plunge or want to plunge at any of Illinois’s 21 locations, visit PlungeIllinois.com.